Since the inception of the International Rule in 1907, the 6 Meter Class has had a remarkable influence on yacht design and sailing competition. From the 20's to the 50's the 6 meter was the class of choice for contests not simply between boats, but between Nations. Some examples of past Nation-based contests sailed in sixes include the Scandinavian Gold Cup, the One Ton Cup, the British American Team Race, the Seawanhaka International Challenge Cup, and the Olympic Games. The sixes lost Olympic status after the 1952 Games and was eventually supplanted in all of these Nation based events. · We invited teams of 4 sailors from 4 nations with active fleets to come to Port Madison, just outside Seattle, stay in our homes and sail our boats. 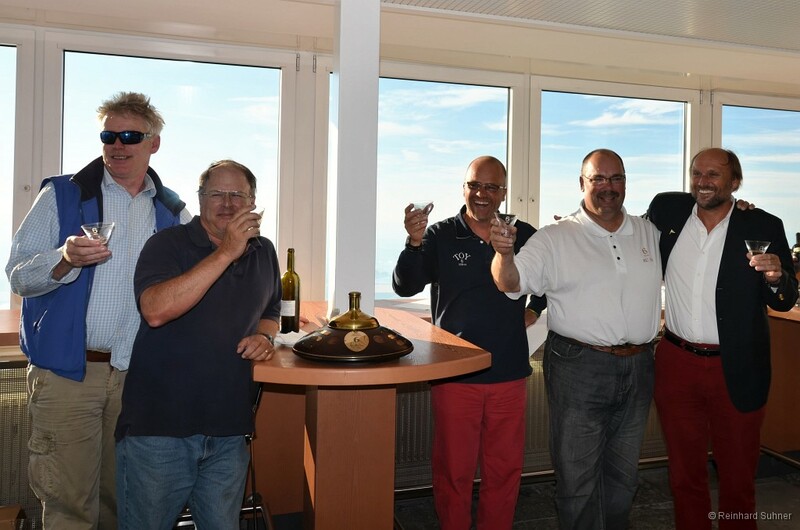 · Kimo Mackey commissioned a beautiful trophy that has at its center a flask filled with Linie Aquavit - a six meter sailor's drink - and six engraved glasses, along with an indestructible carrying case made for traveling. Kimo was also the "Tsar" of the event - which simplified all decisions. What the Tsar wanted is what happened. · PSSMA ran the races, provided sack lunches, and had an owner representative for each boat. · Each team raced each boat in 2 races, and then rotated to another boat. · Other sixes in the fleet started 1 minute after the competing nations and simply sailed for fun on a beautiful weekend. · We had parties or gatherings every night. · We mandated that the host nation could not win, thus assuring that the competition would move to another country willing to host the regatta next time.